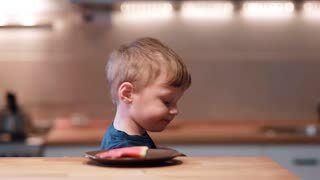 Little boy sitting at the table, turns the head and sees watermelon on a plate. Male shout of joy and take a bite. CLOSE UP: Businessman checks watch and sees he is late for an important meeting.